Shelley and I have been playing Lego Star Wars II on and off for some time now, a level or two at a time. If you haven't played it, you definitely should. It is a brilliant little game with a great sense of humor, though there are some elements that make it feel like a direct-to-pc port, with console focused menus and gamepad oriented controls. Regardless, Shelley and I launched in, puzzlin' and lightsaberin' our way through multiple levels. It was a fascinating experience: she had not played a video game since Super Mario Brothers, and has had to learn to walk all over again. Gamers take for granted the very specialized unconscious knowledge that we've been taught as the game evolved. Translating the two dimensional swivel of the gamepad joystick into a three dimensional environment viewed on an entirely different angle is not a natural ability. Even the pressing of buttons is a language in itself, as gamers are able to assign virtual motions and actions to specific finger movements, and to change those designations with each game they play. When I switch from Lego Star Wars to Psychonauts, I don't have to look at the controller and reassign my finger motions, I don't even have to think about the controller at all. My physical body is backgrounded by my virtual avatar. If you think about it, it is a pretty amazing thing that the human mind is powerful enough to divest itself from it's own physicality and inhabit a completely virtual or imaginative sphere. We've all been there, when you reenter your body after a particularly engaging session of gaming and realize that you have sat nearly motionless for hours, that your legs hurt and you're starving and it's two in the morning. That was my experience with Civilization IV, and there is not even an avatar in the game to inhabit! I had become pure mind, a hovering brain floating above the world and deciding the fates of millions. The same experience can be had with any truly engaging book, when the book in your hands ceases to exist and all you experience is the image, the voice in your head. Georges Poulet's essay "The Phenomenology of Reading" is an excellent account of that beautiful, terrible loss or sharing of self. Or, for another angle on the idea, read the first two hundred pages of Marcel Proust's Swann's Way. Proust not only speaks to the act of reading as freedom from that physical binding, but his prose itself is entrancing, almost hypnotic, but always beautiful. I just began to reread Swann's Way, and I find that I am endlessly amazed at how the novel is built, his long weaving sentences that parallel the freedom with which it moves through time. Substitute gaming for reading in either of those works and the feelings don't change. I would be ridiculous to place gaming on the same plane as Proust or any of the other literary geniuses, though that is no sleight against it. I don't know if gaming will ever rise to that capacity, though I do believe that it is a possibility, if tremendously far removed. Such works can only be the product of a singular mind controlling all the aspects, and gaming, like movies, is hamstrung by the fact that you need hundreds of employees and prohibitive production costs. But I digress, that's a talk for another time. 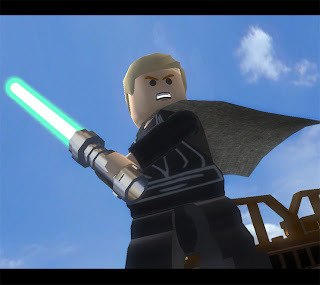 We were originally speaking about Shelley's adventure in Lego Star Wars II, right? After learning how to move in the game's three dimensional space, the next hurdle that she has had to overcome is the visual language that games use. For Shelley, the screen is like a real area, where all of the items need to be paid attention to, but where individual differences do not distinctly stand out. For me, as soon as we enter into a new area I have, in a split second, mentally tagged each item that is usable, shootable or movable. The jumping lego blocks, the sparkles of the force, the jiggle of items that the developers wanted you to see, each of these stand out to me as if they were outlined in red marker. Any gamer would experience the same thing, because we are unconsciously attuned to those elements, we've been trained to notice things out of place. If you listen to the developer's commentary in the Half Life 2 episodes or in Portal (lovely Portal), they speak very clearly to the tricks that they use to tell the player where to look and what to look for. In some respects this training carries over into the real world. If Shelley asks if I've seen any particular item she's looking for, most of the time I can tell her where it is. As I move about the house part of my brain actively takes catalog of how things look, notices things that are out of place and tags them. The most fascinating thing in all of this is that all of these processes are acting subconsciously, have become automatic in gamers. It is no surprise that Shelley has some difficulty jumping from platform to platform, I do too in 3D platformers. Not only is that the clearest test of the translation of joystick motion into three-dimensional space, one must also deal with the lack of a real depth of field. Games can simulate a three dimensional environment, but until we have two distinct viewing angles working in concert, as with our natural vision, I will always have difficulty platform jumping in empty space. Shelley has picked up the game surprisingly quickly, the concepts and the mechanics especially. She does amazingly well considering she is operating without the underground processes that gamers and game developers take for granted, the visual and conceptual language that has been in constant development since Asteroids.